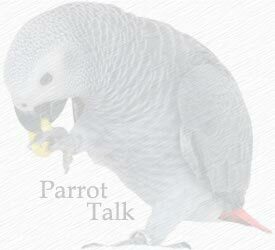 Parrot Talk is proud to recommend the breeders on this page. Each has been awarded the Parrot Talk Seal of Approval. No sales of un-weaned babies to pet owners. Babies are weaned to a varied pellet-based diet. Babies are fully fledged before the wing flights are trimmed. The health of babies is guaranteed. Carol Schieferstein Yellow Crown Amazon Babies from only 1 pair. No Shipping. Provides a one year guarantee for babies. Located in Indiana. Whippoorwill Corner Farm Specializes in Timneh Greys, located in WV.